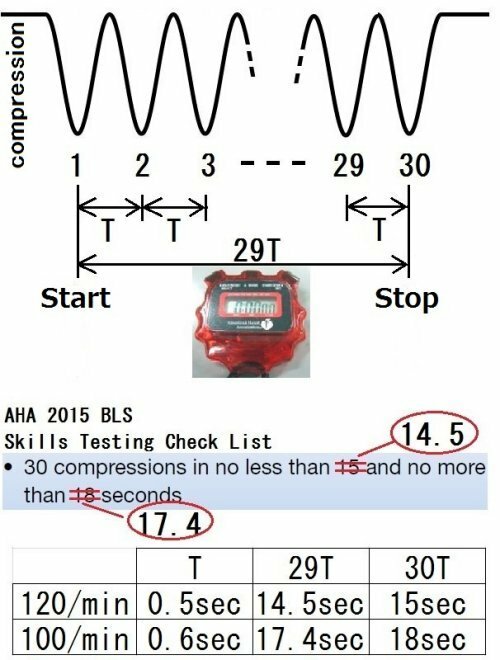 30 Compresstins time is "14.5-17.4sec", not "15-18" on AHA 2015 BLS Skill Testing Checklist. >　Stop your Stopwatch at the end of the 30th compression. the number of seconds(c) means for 29-cycle,not 30. The number of seconds "15-18" on Skill Testing Checklist is inadequacy. It should be updated to "14.5-17.4"
It becomes such as the following discussion. It is maybe too slow ,and poor balance between upper and lower. (2) If Pass Range is between 17 and 15 sec,it permit 99/min to 120/min. It is good balance, there is no margin for measurement error. (3) If Pass Range is between 18 and 14 sec,it permit 94/min to 129/min. It is enough balance, there is margin. So we recommend (3) or (2) as BLS Pass Range on Skill Testing Checklist. 30 compressions in no less than 15 and no more than 18 seconds. It is poor balance between upper and lower. 30 compressions in no less than 14 and no more than 18 seconds. 30 compressions in no less than 15 and no more than 17 seconds.